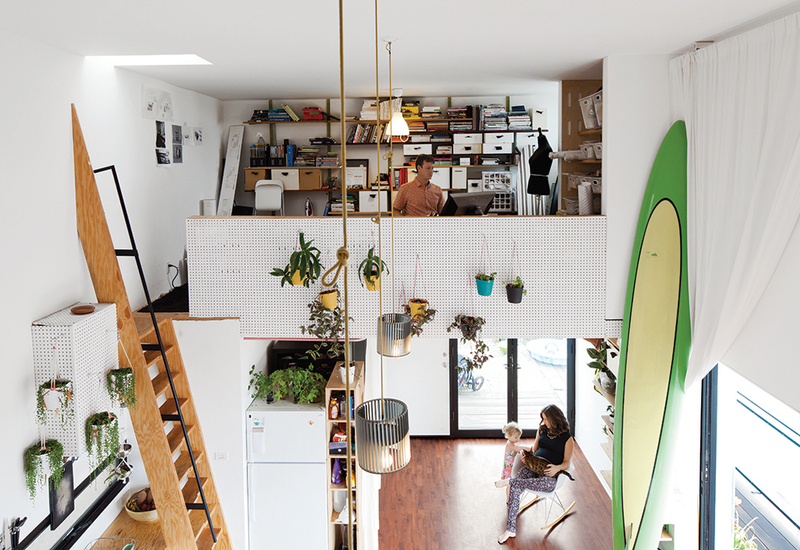 In Los Angeles, architect Hector Perez built eight live-work units—all less than 600 square feet—for around $130 a square foot, relying on board-formed concrete walls, plywood paneling, and passive cooling. The low partition around the lofted sleeping spaces is made of cheap pegboard, painted white to maintain an airy feel. Toronto designer Margaret Oomen customized pegboard she bought at Home Depot with two quick and cheap coats of chalkboard paint. She's used it to display her wooden spoon collection, antlers and bones, and as a seasonal light board and large-scale modern cross-stitch design. Sometimes, pegboard can work as an architectural canvas, like in the case of this Massachusetts loft. For the bookshelf—essentially an oversized pegboard wall that wraps around a bathroom—Merge Architects blended handcraftsmanship and digital tooling by crafting a three-dimensional, undulating pattern across the surface of the volume by sticking in dowels. A new family moved into late architect David Boone's 1972 house outside of Berkeley, California, and continued its tradition of live/work space. The garage sports a handy pegboard hanging systems for tools. The owner of this Los Angeles home prioritized solar, insulation, and heating and cooling and "bit the bullet" on the budget for these three green systems. The rest of the house is sparsely and cheaply appointed, with primarily IKEA furnishings and a basic pegboard floor. Pegboards are a natural tactic for kitchen storage, especially in rentals. "A pegboard is a good way to hack a rental kitchen without spending much money," Smitten Kitchen's Deb Perelman says. "Julia Child hung her pots and pans and utensils on one. Even if you can’t take that physical pegboard with you—they're really inexpensive—you can set all the pegs up in another kitchen.” More tips from Perelman in our November issue. Photo by Ye Rin Mok.